We're following up on last week's Morrocan Chicken recipe in which I promised to get back to you after I made it with fish in place of chicken. I'm happy to report that as good as that chicken was, the fish version was just as good, if not maybe a bit better even. I know you can't even tell that there's fish under all of the sauce and olives, so you will have to take my word for it... there's a beautifully fresh piece of lingcod resting peacefully on that pillowy soft bed of couscous. Oh yeah. 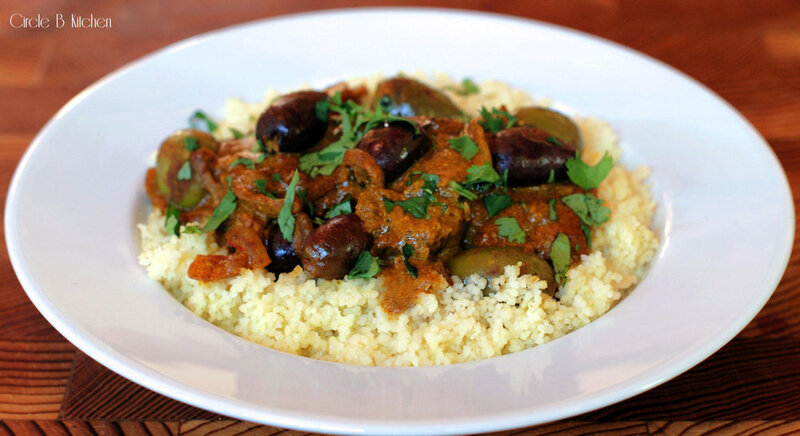 This is the seafood version of our Moroccan Chicken Smothered in Olives. I would be hard pressed to choose a favorite between the two, but it's possible that the fish may have won by just a bit. Amazingly delicious. Use a meaty white fish here such as cod, halibut or lingcod. If you choose a thinner filet such as snapper or tilapia, just reduce the cooking times a bit. In a small bowl, combine the ginger, turmeric, cumin, paprika, cinnamon, coriander, salt and the cloves. Stir to blend well and set aside. In a large-ish saute pan or skillet, saute onion slices in 2 tablespoons olive oil till soft and cooked down by about half (about 10-15 minutes). Add the garlic and the spices. Saute for a couple of minutes or until the spices are fragrant, and then add the fish. Turn to coat with the spices. Add 3/4 cup of the chicken broth. Bring to a boil, then reduce heat to medium-low. Cover and simmer for 5 minutes, turning once. Combine the remaining 1 cup chicken broth with the harissa and yogurt and add to the pan. Stir to incorporate and add more broth, if too thick or more yogurt if too thin. Taste for salt and spice. Scatter the olives over the sauce and then simmer partially covered for 5-6 more minutes. The fish is done when it begins to flake and the center is no longer translucent. Be careful not to overcook it! To serve, sprinkle with a little more cilantro and serve over couscous. We also like to serve it with a little dollop of yogurt on the side.